Thailand is one of the most visited country in the world because it has almost everything to offer. It is a very affordable tourist destination, have the best beaches in the world, its a shopping paradise and much more. With all the upsides, there are some serious downsides. 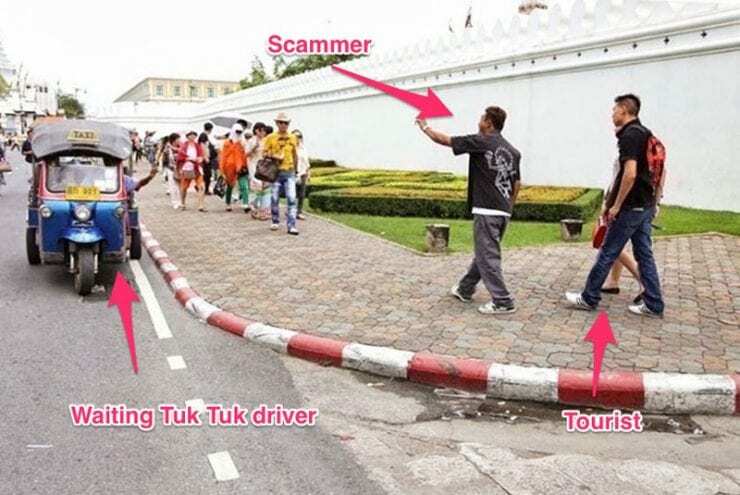 Almost every tourist coming into Thailand will face scammers or tourist trapper trying to rip them off. They are common Thai walking around the touristy streets looking for opportunities. They will scam you for everything; be it sightseeing, tailors, jewelry, or prostitution. 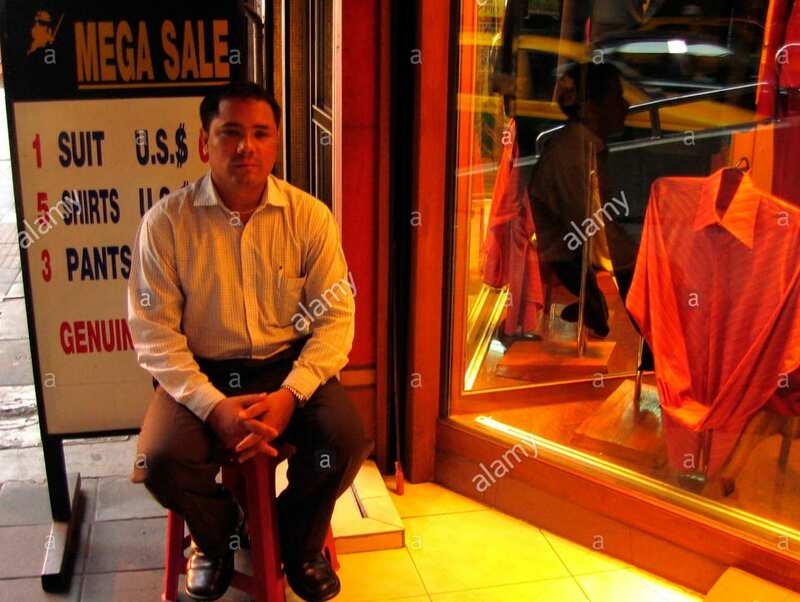 We will only discuss Thailand famous tailoring scam here. Tourist will find huge billboards of deals like “1 suit for 100 USD” or “Two Italian suits & 2 shirts for 250 USD” all across the main tourist street in Bangkok. It is indeed a bargain price for someone looking to buy custom tailored suit at the cheapest price possible. But the question arises that, will the suit stand the test of time? That’s doubtful. It works for someone who wears a suit maybe once a year. But if you are looking for a quality suit that last you a long time and fits like a glove; finding a quality Tailor Bangkok is a struggle. You’d be lucky if you are walking on the street and you haven’t been approach by tour guides, tuk-tuk driver (3 wheeler taxis) or hotel concierge luring and pushing you to visit these so called “commission-tailors”. These tour guides, taxi drivers and hotel concierge get up to 35-40% commission by these “commission-tailors”. So these tailors in return charge customers high price so that earn decent margin after paying for the fabric, stitching cost and commission (account for the major percentage of their cost) . Quality is not their priority, saving their cost is. They offer polyester fabric even though they advertise it as wool and they employ the cheapest of workmanship. Do not take suggestions: Avoid any kind of pressure by tuk tuk drivers, tour guides and hotel concierge to visit these specific commission-tailors. They may claim they know the trade & industry and may also claim they know the best tailors in town, but do not believe them! If you ask for directions to specific tailor from hotel concierge or tuk-tuk taxi, you will not be taken there. They will claim that specific tailor has closed down or the street is shut or there was a big fire last night. Do not believe in deals that are too good to be true. 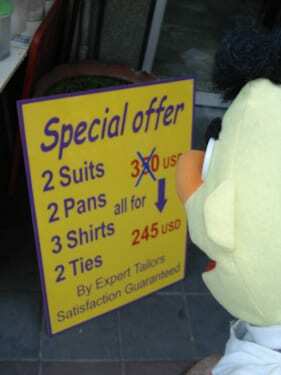 Deals like 2 suit for 200 USD should be avoided. You will end up with synthetic suit. A good hallmark price for a quality suit in Thailand is minimum 300 USD, which is 10,000 THB. Make sure there is a minimum 2-3 fittings. Make sure you know the quality of fabric, lining, canvas, inlays used in the suit. Do your research. Choose tailors based on online reviews, friends recommendation and Press Release. Avoid choosing a tailor on ads. Press release make the tailor shop or tailoring brand credible. We openly reveal the true composition of fabrics; if its wool blend or pure wool and the country of origin; be in China or Italy. Our workmanship and detailing is of superior quality. We use high quality canvasing, interlining, buttons, inlays etc.